Let me start off by mentioning I am not at all an organized person. I never carried around one of those day planners. I live by the spur of the moment. The last thing I thought I would ever get was a PDA. But as I get older, and now with kids, I tend to lose track of my own schedlue. I\'ve also had too many scrap pieces of paper with people\'s phone numbers, directions to places, dental reminders, you name it. In 2000, I bought a Handspring Visor. It ended up getting used constantly and I was extremely happy with the purchase...until it started conking out on me. I\'ve been without the Visor for nearly 2 years, but I have finally bought a new PDA. This time, I got the brand new Palm Tungsten E. I am even more happy and pleased with this PDA than with the Handspring. The construction seems to be quite sturdy with a dull metal outside. It fits nicely in a shirt or pants pocket. It comes with 32 MB of RAM (28.4 MB is usable for user storage), a beatuiful, bright, 16-bit color screen, and an extremely useful bundle of add-on software. There is also a slot to add a Secure Digital (SD) card. 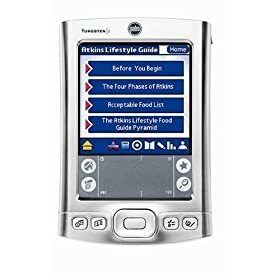 The Tungsten E uses the latest Palm OS 5 which contains your typical address book (called Contacts), calendar, tasks, and memos. There is even a notepad which lets you handwrite notes directly on the screen without having to use the graffiti area. And speaking of graffiti, it uses a new Graffiti 2 which is more like writing letters than the original graffiti. Having color is extremely handy. You can color code your categories for the calendar (work, church, personal, etc.). In doing so, I can get an easy overview of what I have coming up. I\'ve set all church functions as red. Now, when I see red, I am continually reminded I need to be at church. For example, this last weekend, our church had a BBQ. I played for a worship time and needed to get there early for practice. All last week, I kept seeing the red for Sunday and was continually reminded about this event which is a good thing. I would probably have forgotten about the practice without the reminder. I like using the Tasks application for reminding me of prayer requests. If someone has a prayer request for a particular day (for example, an interview on Wednesday), I add it to my task list for that particular day. When Wednesday rolls around, I get a pop-up window reminding me to pray. I am also using Tasks for my work with both CCGR and Christian Gamer\'s Alliance (CGA). I have a running list of things I want to add/write/discuss and I use the task list to maintain all those thoughts. I am quite amazed at the bundled software. I must admit, the bundled software was a big decision in my purchase. It comes with the latest version 6 of \'Documents to Go\' Professional. This allows you to view and edit Word, Excel, and Powerpoint presentations. There is a PDF reader (for Adobe Acrobat files) as well. Standard is also the Palm Reader. They essentially supply you with the major applications you will need to read just about any document. For multi-media, you can listen to MP3s, watch videos, and store photos. For listening to MP3s, they supply you with RealPlayer for Palm. The sound out of the headphones sounds great and is loud enough...even for me. :-) There is Kinoma which allows you to watch videos. I am able to take my family videos and carry them around in my shirt pocket. Quite nifty. Standard with the Palm OS is also \'Photos\' which lets you store and view photos. It\'s an electronic version of wallet photos. The one missing item is a voice-recorder. That was one thing I really wanted. I am a musician and I will sometimes come up with songs in the car, but I end up forgetting them by the time I get home. Also included is MobileDB for creating all sorts of database storage. For example, I created a database listing games and their release dates. There are also two games (Hearts and War). A calculator. Financial software. And more. I think Palm did a smart move with all of the extra add-ons. Unfortunately, the Tungsten E does have its problems. The first is there is no docking cradle. You need to manually plug in the power cord and USB cable into the bottom of the unit. It\'s a slight annoyance, but not really a big deal. The second is a little worse. The battery is not removable. Once the battery is dead, your unit is too. You can probably have Palm fix it, but for a \'nice\' price. And third, as I mentioned above, there is no voice-recorder. As you can tell, I am extremely pleased with the Palm Tungsten E. It\'s a great price ($180 street price) and comes with a nice selection of bundled software. The battery life lasts about a week for me, and I use the Palm quite often and sometimes for extended periods of time (playing games, editing an Excel spreadsheet, CCGR/CGA work, reading AvantGo, etc. ).